Once again I share with you the photography and words of one of my favourite bloggers. 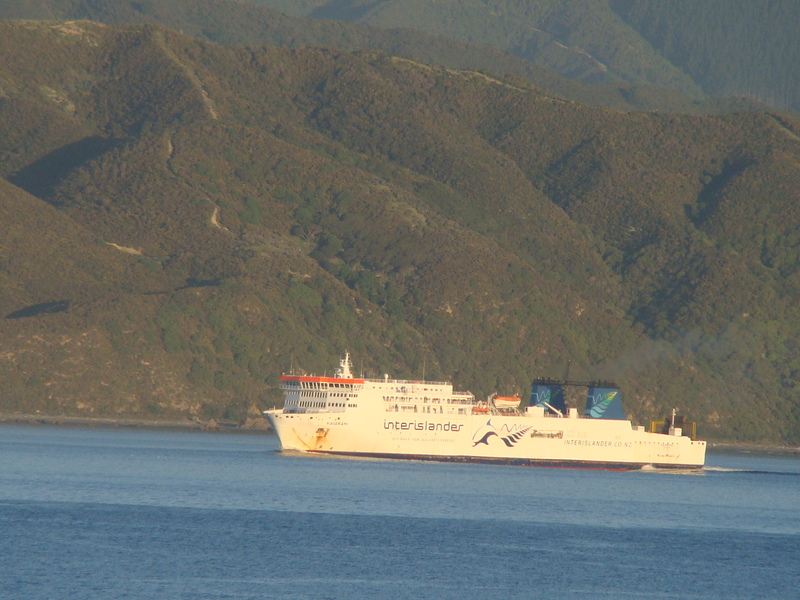 The “Radiance” departed Picton wharf about 7pm on a fairly calm sea. Having heard stories over the years of how rough the passage through Cook Strait can be, I wondered how the evening would progress. Cook Strait lies between the North and South Islands of New Zealand. 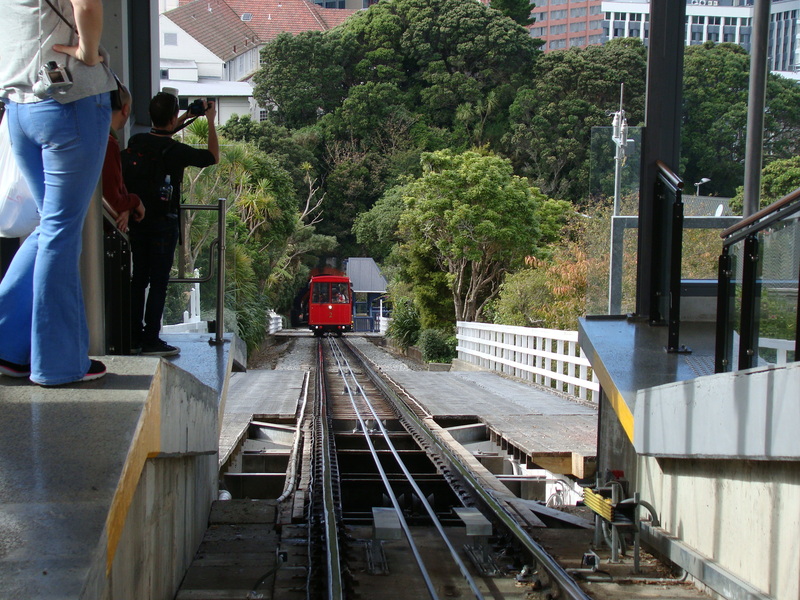 It connects the Tasman Sea on the northwest with the South Pacific Ocean on the southeast, and runs next to the capital city, Wellington. It is 22 kilometres (14 mi) wide at its narrowest point, and is considered one of the most dangerous and unpredictable waters in the world. The strait is named after James Cook, the first European commander to sail through it, in 1770. 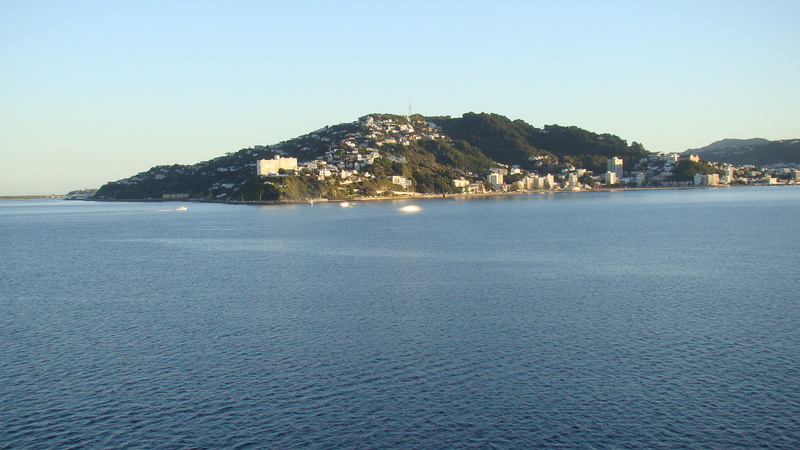 Once again, we were blessed with peaceful cruising and the following morning, as our ship dawdled towards Lambton Quay to dock, we crossed paths with an -“Inter-islander” Ferry heading out towards Picton, some three hours away. 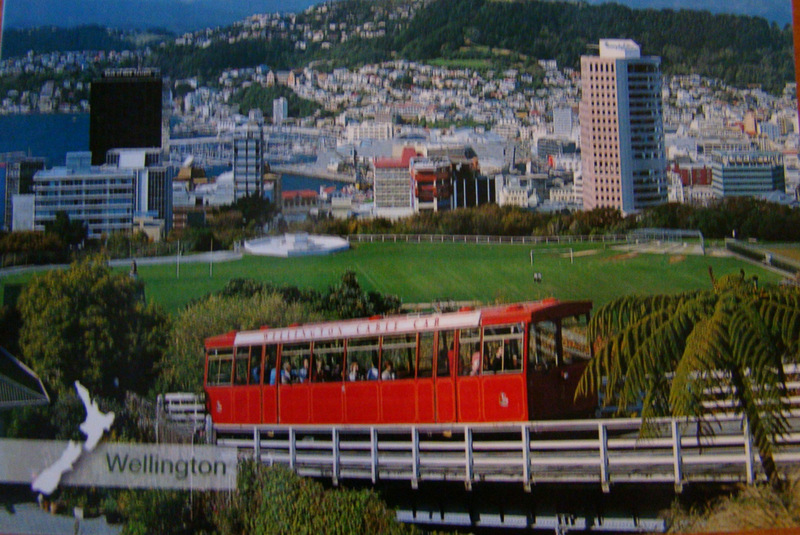 When I last visited Wellington (also on a cruise) I spent most of the day visiting Zealandia and the Museum of New Zealand (Te Papa Tongarewa), so this time I decided to ride the Cable car and enjoy the sights of Wellington from the lookout and tea rooms at Kelburn Park. the Lady Norward Rose Garden with over 3000 different species of roses; a sculpture trail featuring , among others, Henry Moore’s Bronze Form; a Duck pond; a Begonia House. As my camera battery “died” at this stage, the Botanic Garden remains on my bucket list! Cruising is a wonderful way to visit new places, but it’s only an appetiser or teaser: so much to see and so little time! 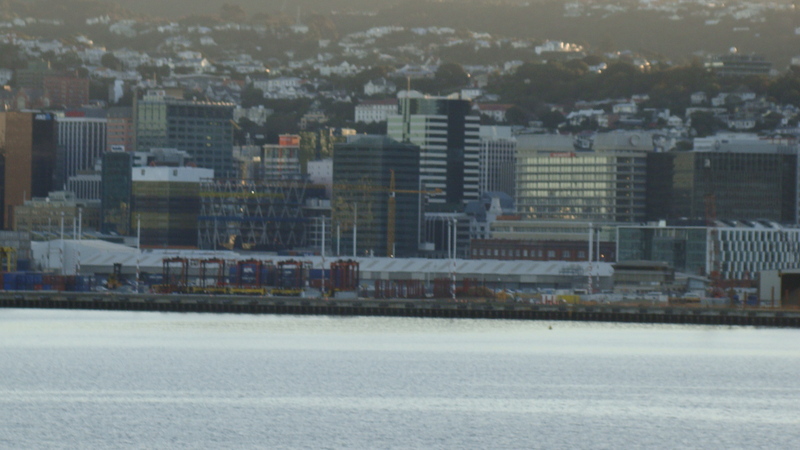 It was about 4pm we said farewell to Wellington to head north and east towards French Polynesia. A chance email received about December 15, last year, gave my long dormant travel-bug a wake up call! The thought of some 18 nights cruising, visiting two ports in New Zealand, before heading into the Pacific to visit three ports in French Polynesia and then finally having a couple of days on the island of Oahu in Hawaii before returning home, had me scrambling to make arrangements. However, before attending to travel matters, I checked first that my cat sitter extraordinaire was available to care for Sam. YES! Anna was available to come and care for Sam, which left me free to plan my escape. April 18 saw me dragging a rather heavy case first around Brisbane Airport, then Sydney airport as I hunted for the coach to take me to the docks. Memo to self: Do NOT pack so many clothes if there is a “next time” to travel. 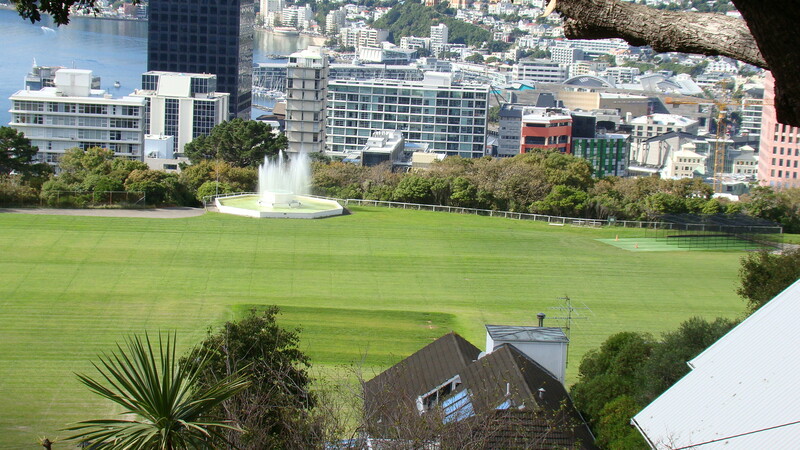 Do not allow for Wellington’s capricious weather. PACK LIGHT. 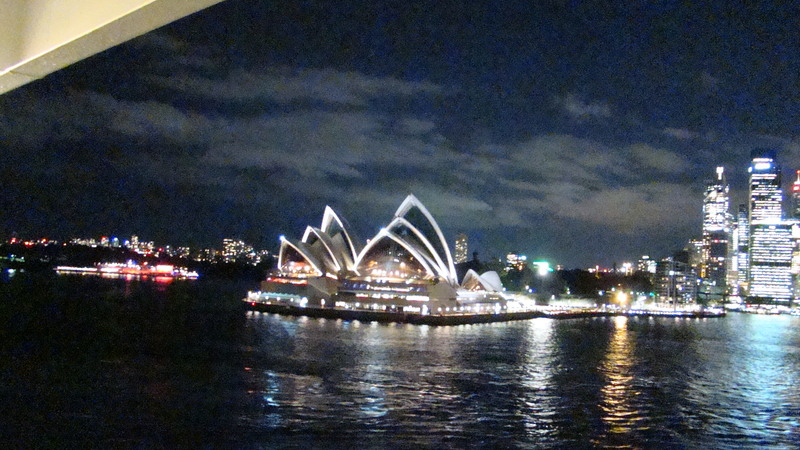 We left the dock about 8.30pm and I tried to photograph the Opera House ,the Harbour Bridge and Luna Park, but the included photo was my favourite As the Radiance of the Seas approached the Sydney Heads, you could feel her anticipating the open waters as her movements became a little more lively. After unpacking it was time to visit the Champagne Bar and toast to a happy voyage. 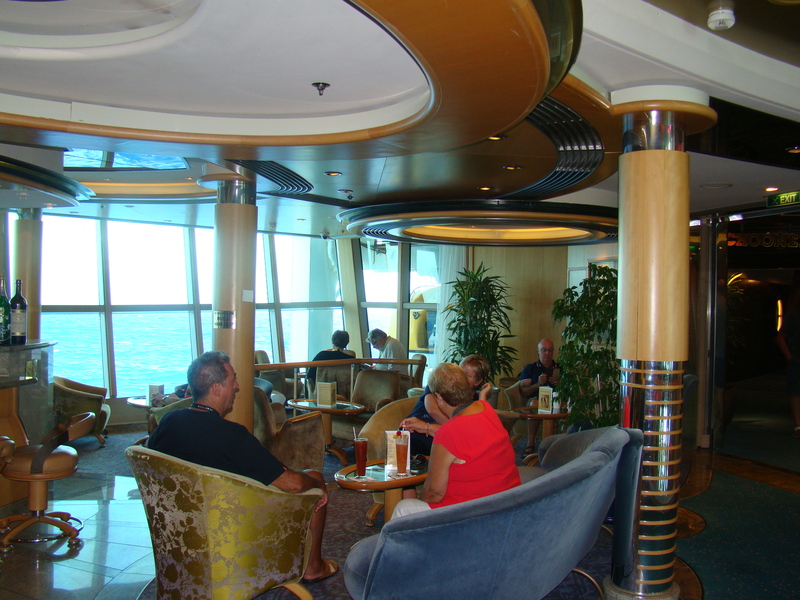 This bar became a favoured place to sit and read; converse with others and (in comfort) watch the seas roll by. It was also a great place to sit ,people- watch and listen to the excellent music provided by various groups and entertainers. 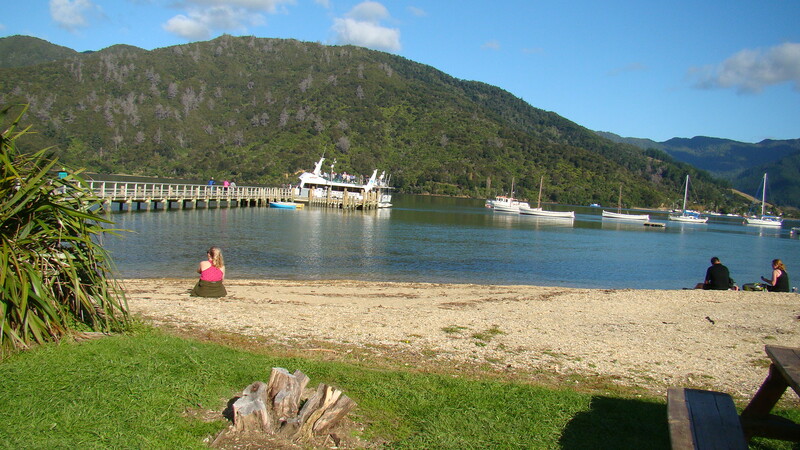 After four days of cruising in calm and sunny conditions we reached the port of Picton, which sits at the head of beautiful Queen Charlotte Sound. 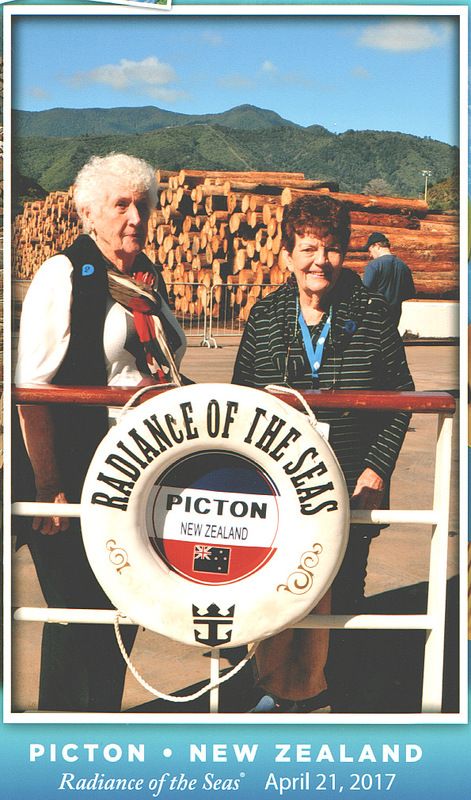 Picton does not have a large wharf: in fact “Radiance” caused a cargo ship to be on anchor as with 2,500 guests on board we took priority over the ship which was loading timber for the Asian woodchip market. I normally steer clear of having photos taken, but this is included to show the heaps of logs awaiting export. 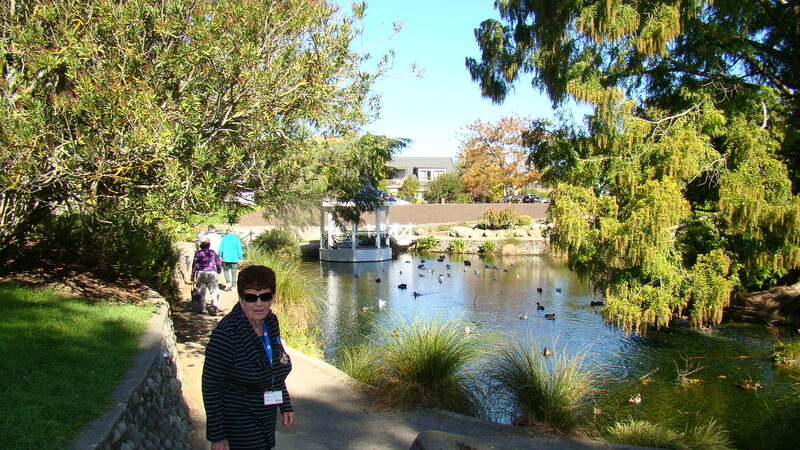 We joined a three hour tour of Picton, Blenheim and surrounds, which included the famed Marlborough vineyards and wineries, as well as a drive past the Omaka Aviation Heritage Centre which presents a Knights of the Sky exhibition of WW1 aircraft and artefacts owned by (Sir) Peter Jackson with sets created by WingNut Films and Weta Workshop. 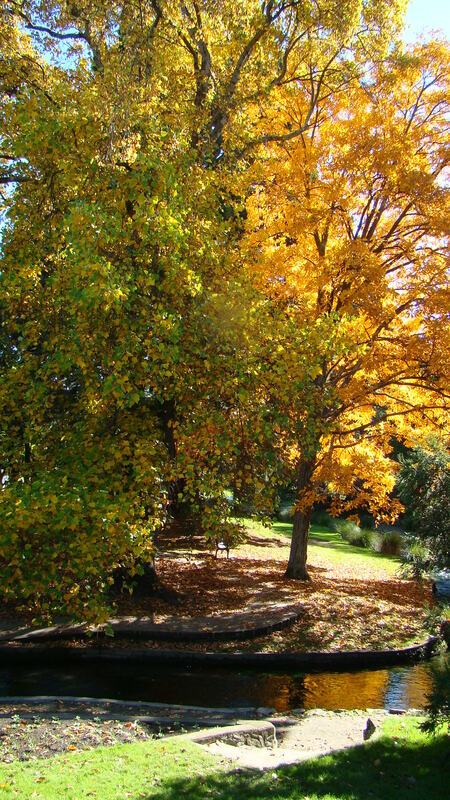 A short stop was made at Pollard Park where the autumn leaves were just starting their colour change. The coach then dropped us near a jetty where we boarded a catamaran to explore the Sounds, before leaving us to make our own way back to the dock to cruise overnight to Wellington. After composing several pages of descriptions plus photos relating to my recent vacation, and “carefully” saving the draft before a final edit and publish: I managed to lose the lot! This Thursday instead of Lazy Poet, I’m re-posting a poem I wrote a few years ago, for International Women’s Day. Yes I know that was yesterday, but you know me by now, the other week that I got the day wrong for wordless Wednesday, and the syllable count wrong for LP! Anyway, today, come what may I was determined to complete the Morning Glory. Morning Glory! Certainly not one of my better pieces, but I think for the next steps I will stitch samples of various stitches. The centre of the blossom is a mixture of French and Colonial knots, whilst both the calyx of the blossom and the bud are worked in stacked stem stitch. Twenty-seventeen is twenty two days old, and it’s the first time I have opened KenMaursCorner to add new content! Christmas passed very quietly, as except for my daughter and myself the rest of the family were holidaying in Fiji; Colleen was only four days post-op after major surgery, so our celebrations were very low key. Thankfully she has recovered well and will return to work early in February……….I wonder how her fur-babies will react to not having her company 24/7. I didn’t commence stitching until January 5 and progress has been very slow……I certainly have not put needle and thread to fabric every day as other members of a year in stitches apparently do. If I do need an excuse, I guess that the lure of reading a page or three of whatever book I am currently reading is valid. Also , Australia is now “enjoying” Summer. I use the term enjoying very loosely, as most of the eastern states have been sweltering in heat wave conditions, and as I am not a fan of AC except in extreme conditions, my sweaty hands don’t go well with fabric and thread. The first steps were to divide a twelve inch square of dress-maker’s calico into a two inch grid. 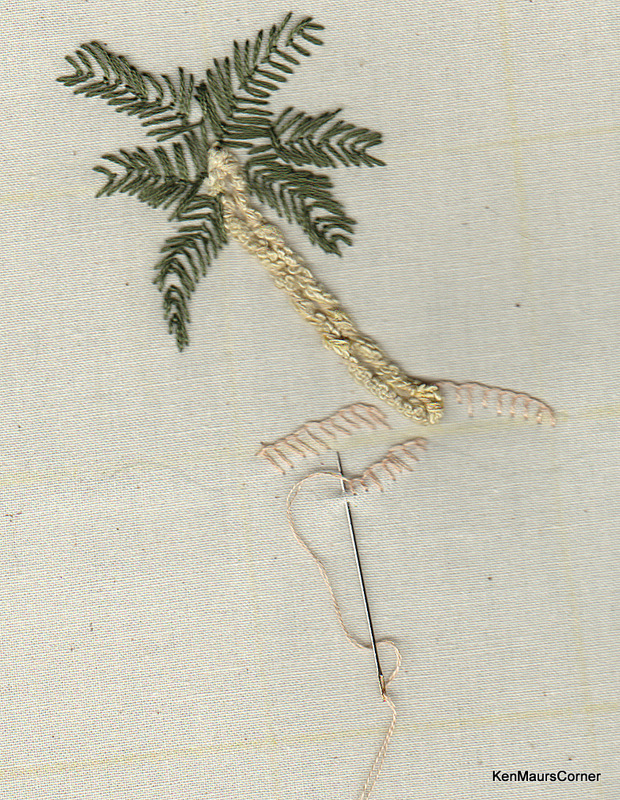 A chenille thread was couched down to the fabric to form the trunk of a palm tree, then fly stitches formed the palm fronds. 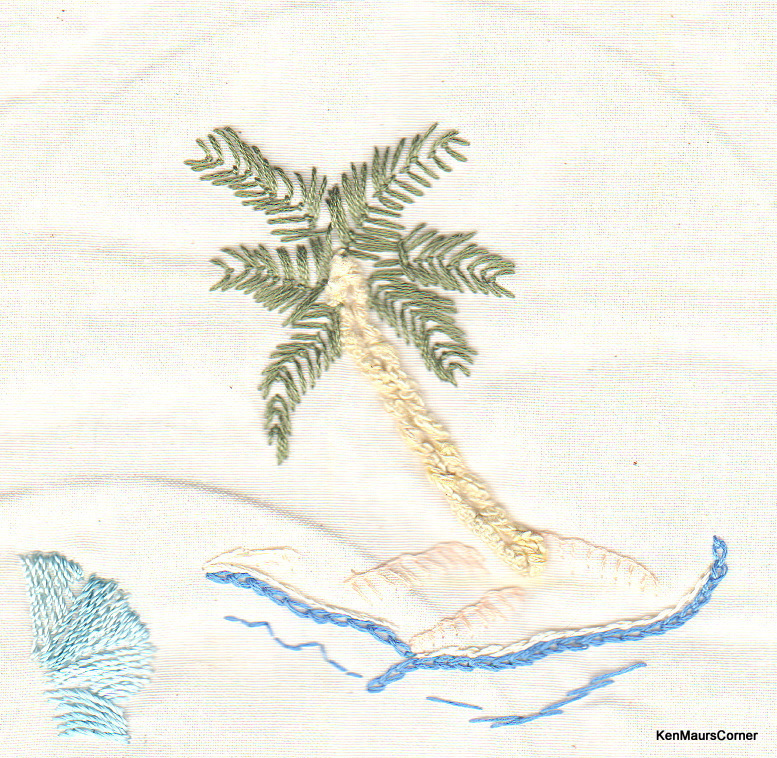 Blanket stitch was added to represent the sandy island. I have used chain stitch plus straight stitches to represent the sea. 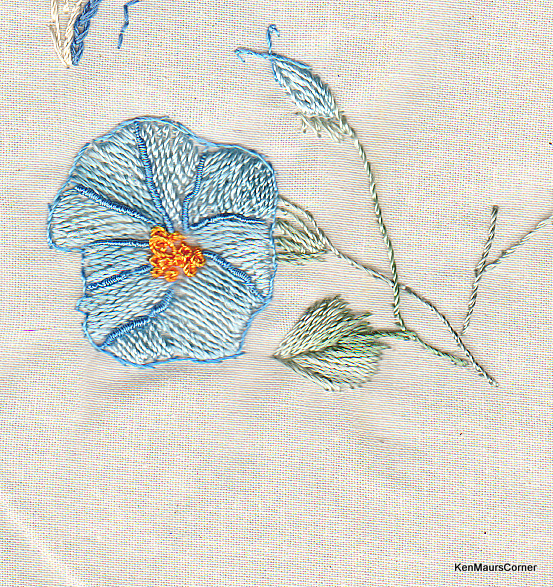 The stacked stem stitch in blue rayon in the lower left hand corner is a WIP–hopefully an example of Morning Glory blossom. Yes! I’m still alive ……I just can’t believe how long it has been since I actually blogged. What can I say! Do I blame it all on getting older? No! That’s a cop out. This year has been a series of being “not so brilliant” as well as lacking totally in any creative urges. Early in September I had a total knee replacement, and since then I have been concentrating on getting over the resulting pain, and trying to do all the exercises suggested to gain full mobility again. I must admit that I also succumbed to some clinical depression due in some part to chronic pain……but that is over now. On that point, it is amazing how some GPs react when a patient asks for help in dealing with Depression! The rest of his questions I found to be both insensitive and insulting. HELLO! It’s 3 weeks since I had a total knee replacement : the pain is stopping me sleeping; I am coping at home alone. This was a guy I had been attending regularly for seven years………I don’t attend him any more. Anyway, enough whingeing! All is good. Mobility is good and pain is minimal. Along the way, I have received postcards from members of Gondwana Textile Artists who heard that I had been bitten by the black dog.. ..I’m still trying to get my head into designing and stitching postcards to send to all of them. I had thought of trying a Gondwana theme; then I thought of fossils from the Wandjina Gorge in the Kimberley region of WA—-but thought they were too intricate for me to attempt in an ever decreasing time frame.